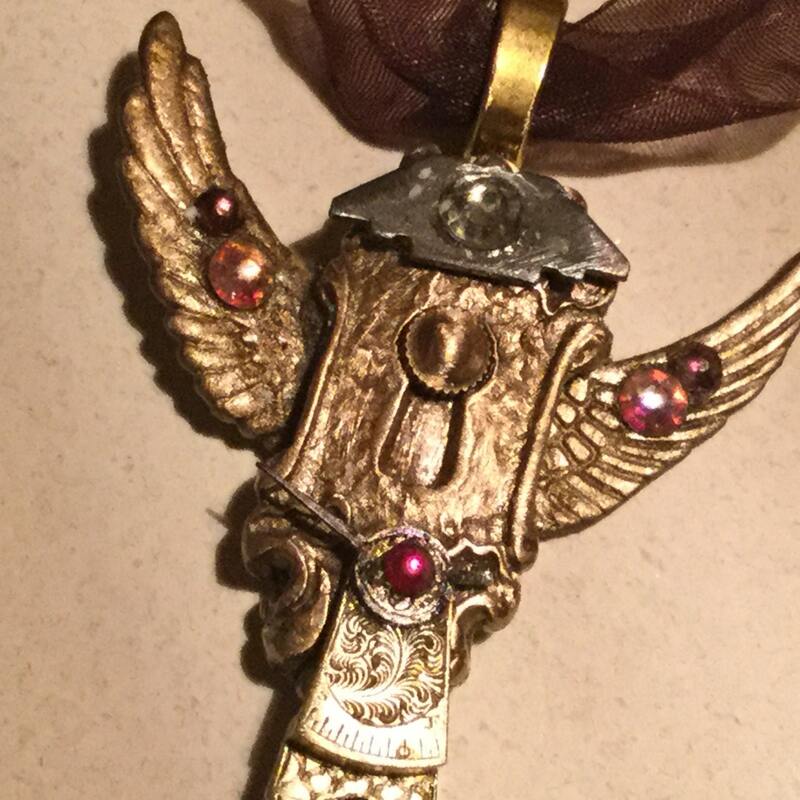 Handmade of pure bronze, the basis of this piece is a magical key hole. 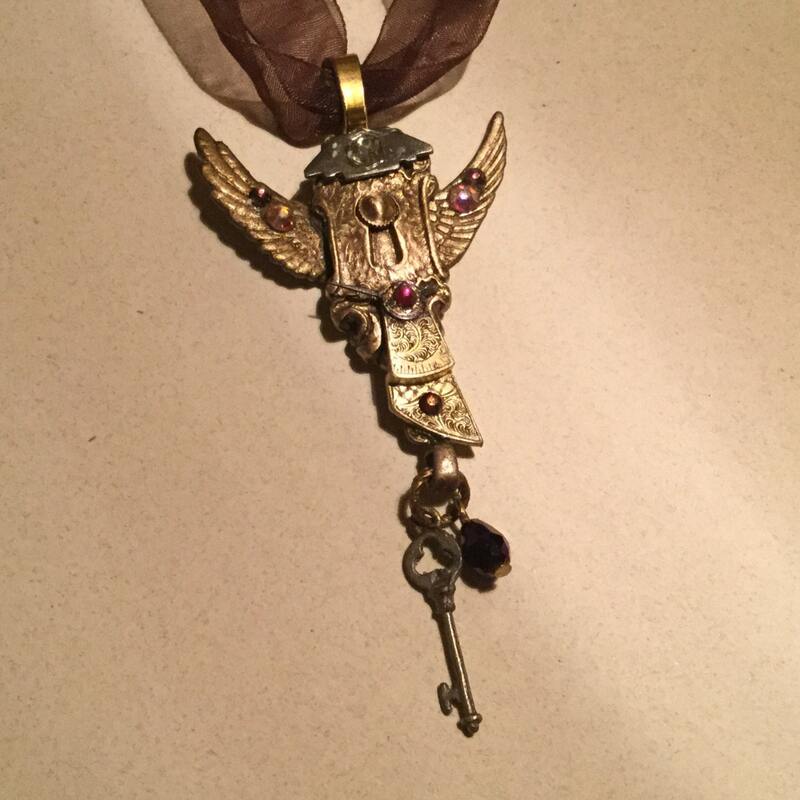 From the key hole hangs a key and a gem that will move with the wearer..
Gems are Swarovski crystals; wings are cast bronze. The piece is strung on an 18" golden brown silk ribbon cord. 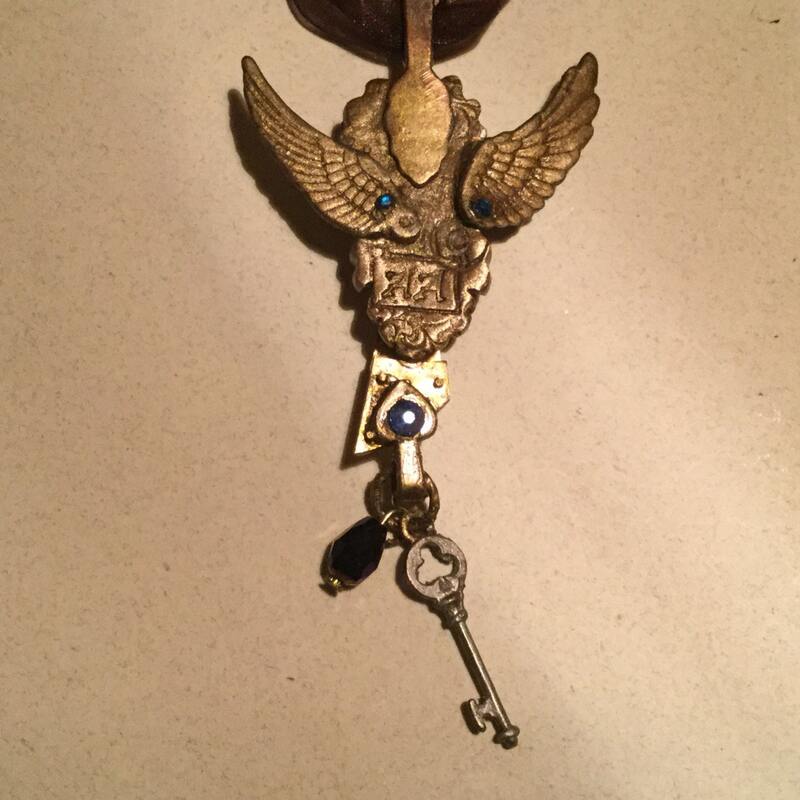 Size of pendant - wing tip to wing tip is 2". 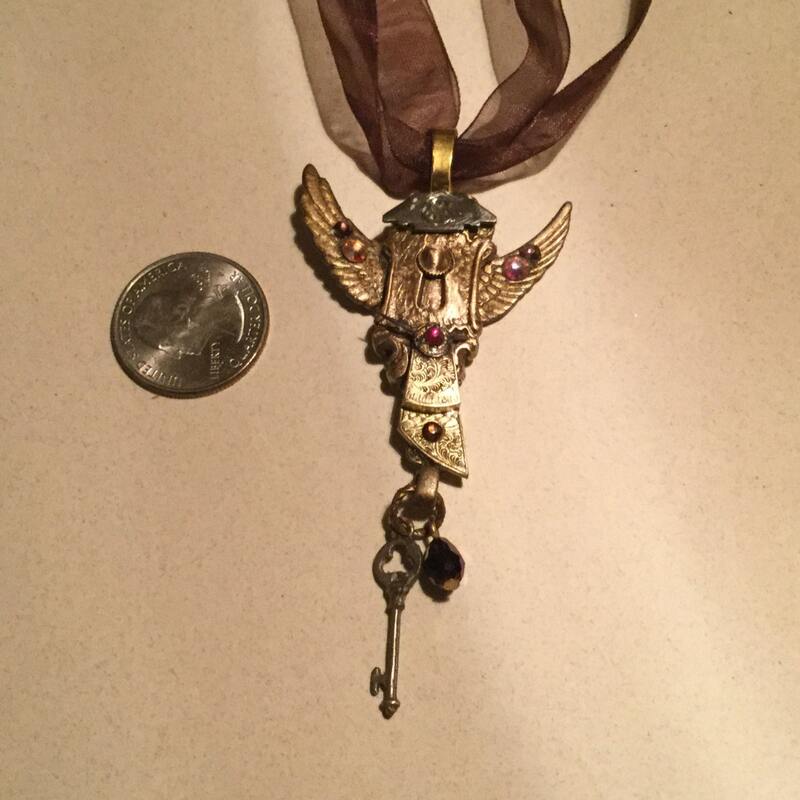 Pendant including the hanging padlock is about 3". 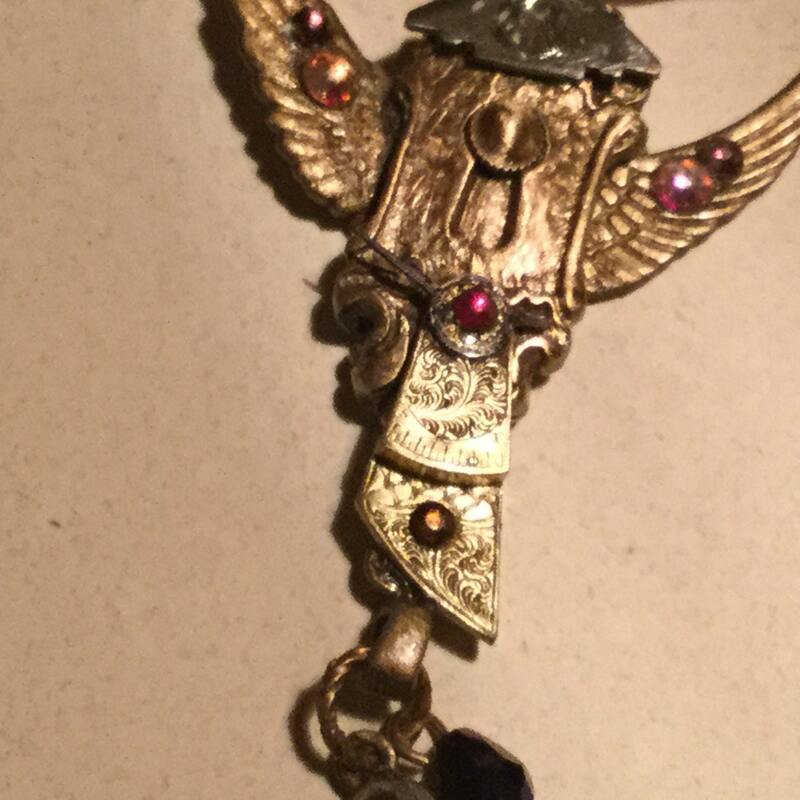 One photo shows the reverse of the pendant. Please note that I finish both sides of my pieces and it is signed. STEAMPUNK is an esthetic that combines late Victorian with the Industrial Revolution and then mixes in a dash of Science fiction. It is characterized by wheels, cogs, keys, keyholes, fantasy, locks, feathers, top hats, leather wear, gadgets and kizmos, goggles, and all things relating to nature and especially the planets and heavenly bodies. In short, it is wonderful fantasy! To gauge size, one photo includes a quarter as a measure for comparison. The images are a bit deceiving in that the piece looks large in the close ups. However, this photo indicates just how small I work. As with all fine jewelry, your piece should be treated delicately. It should not tarnish as it's been coated with a sealant. However, enclosed in your package will be a small jewelry polishing cloth as a gift to you. Shipping for one item is $6.50 via USMail. I ship in flat rate, small boxes, and the packages are tracked. You will receive an email telling you that the package has shipped. If two purchases are made, they can be shipped in the same package for NO additional postage. Please note that Etsy may charge double shipping but I will refund one shipping cost to you.